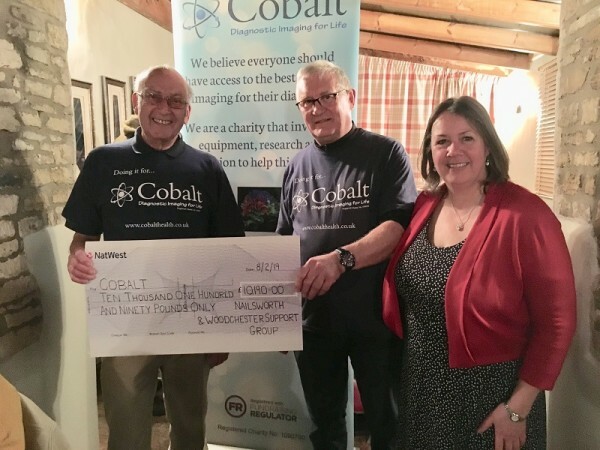 Nailsworth and Woodchester Support Group handed local medical charity Cobalt a donation of over £10,190 at an event in February hosted by the Royal Oak, Woodchester. The donation follows a year of fundraising including money raised by Stroud Vintage Transport & Engine Club who host the annual Gloucestershire Vintage and Country Extravaganza in South Cerney, the Royal Oak, Woodchester and donations made from Arthur’s Spring Stroll, an annual fundraising walk. In addition coffee mornings, the Nailsworth Goodwill Evening and collections of loose change all helped the group to reach the final figure. The money raised will be put towards the Gloucestershire Breast Cancer Equipment Appeal to purchase much needed state-of-the-art mammography equipment for the Thirlestaine Breast Centre who serve over 115,000 women across the county. 28,000 screening mammograms are undertaken at the centre each year. Since they started fundraising in 1992, the group have raised a whopping £118,434 for Cobalt. The fundraising will kick off again with this year’s Arthur’s Spring Stroll, a sponsored walk that takes place on Sunday 14th April. This event is well loved and popular with families including their four legged friends. Anyone wishing to find out more can go to https://www.cobalthealth.co.uk/event/arthurs-spring-stroll-2019/ or contact John or Richard on 01453 834066/01453 872635.